Still need some ideas for how to get the kids on your jury to talk and become critics in their own right? Today I will share some KIDS FIRST! tips for working with ages 5-8. Children in this age group respond well to programs that promote a sense of security and accomplishment, such as “how to” programs that teach magic tricks or science experiments; programs concerning separation issues with parents; pets that rescue. They model heroes they see on TV and in the movies. 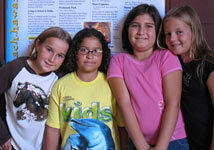 These kids often enjoy fairy tales, musicals, animal stories and other inspirational programs. Though kids ages 5-8 are often quite forthright about responses, they may need prodding for specific comments. Girls and boys may respond differently. At KIDS FIRST! we use actual quotes from the kids on a jury, and we often print them verbatim in our reviews. We recommend trying to talk to the older ones in a manner that they can relate to. For example, one Juror had a six-year-old boy who loved the word “cool.” Rather than asking him if he liked the video she would say, “Johnny did you think the video was cool?” Then she would follow up with “why?” By that time she knew she had his attention and he was ready to explain. Interested in starting your own jury? Visit our jury page to learn more about the program; contact us for information; and sign up for our next jury training course, from the comfort of your own home! This entry was posted on Thursday, September 10th, 2009 at 12:58 pm and is filed under Jury Updates. You can follow any responses to this entry through the RSS 2.0 feed. Both comments and pings are currently closed.